Our shuttles transport UCSF community members every day. Did you know we carry deliveries and bikes, too? Lose something or need help not getting yourself lost? We can help with that, too. If you have any questions or need additional information about any of the following, please don’t hesitate to contact us. ● Senders are solely responsible for arranging for mail pick-up at the recipient’s stop. ● Shuttle bus drivers cannot be responsible for the security or delivery of any item sent. ● No hazardous, contaminated or infectious materials may be placed on any shuttle vehicle unless they are packaged and labeled in accordance with the requirements and guidelines set forth by the UCSF Office of Environmental Health and Safety and the Relevant Use Authorizations; all such materials must be escorted on the shuttle by a responsible laboratory employee. Want to bring your bike to another destination on campus? Our shuttles are equipped with front bike racks that can securely transport your bike. Watch the tutorial. Found something left behind on our shuttles? Please turn it in to the shuttle driver. Looking for something left behind? To inquire about missing items, contact us. Need help getting to a destination not served by our standard shuttle lines? Zuckerberg San Francisco General offers free shuttle service to the 24th St. Mission BART station during peak commute times. This service is free to patients, visitors and staff. Going from Mission Bay to SOMA or downtown? 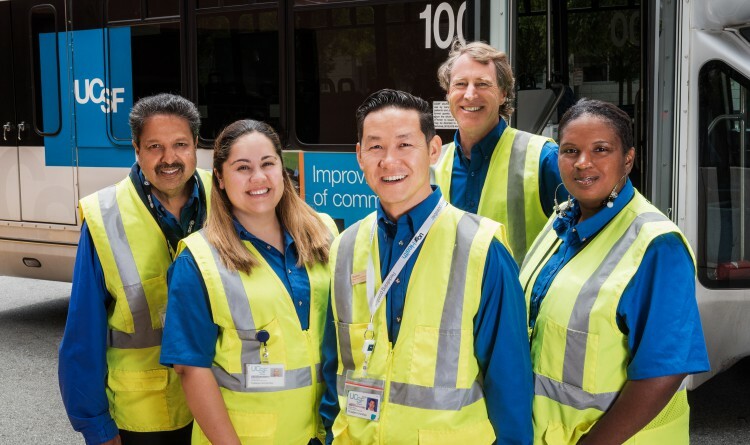 The Mission Bay Transportation Management Association provides transit options to its neighbors, including UCSF.